Amukamara has the size, speed and awareness to start from day one and turn into one of the league’s finer players at the cornerback position. Takes advantage of his instincts and smarts in zone coverage but also has the ability to hold up when asked to cover on an island. Possesses good overall ball skills and hands. Will help out and support the run. Durable, aggressive, competitive and hard-working. No major weaknesses in his game, but isn’t a true burner in terms of straight-line speed. Amukamara will likely be selected early in the first round, possibly in the top 10. Instead of resenting No. 7 Nebraska for leaving the Big 12, maybe Kansas State should thank the Cornhuskers. Who wants to keep playing a team that always beats you silly? Quarterback Taylor Martinez rushed for 241 yards and four touchdowns and Nebraska ended a 99-year rivalry in the same lopsided fashion it began, thrashing the slower, outmanned Wildcats 48-13 on Thursday night. Martinez, a redshirt freshman, pushed his five-game rushing total to 737 yards and also threw a 79-yard scoring pass for the Huskers (5-0), who head off for the Big Ten next year with an domineering overall record against Kansas State (4-1) of 78-15-2. Unbeaten in their first four games and with senior running back Daniel Thomas averaging 157 yards per game, Kansas State fans had hoped to send the Huskers out the Big 12 door with a loss. But the Wildcats were helpless against such offensive and defensive speed and the night belonged to Martinez. He broke the team record for rushing yards by a quarterback and tied the team mark for rushing TDs by a quarterback while Thomas was held to 63 yards on 22 carries. Martinez rushing performance was the best ever by a Cornhusker QB but only the 8th best by any Nebraska player. Kansas State until fairly recent had the worst record of any Division I school. 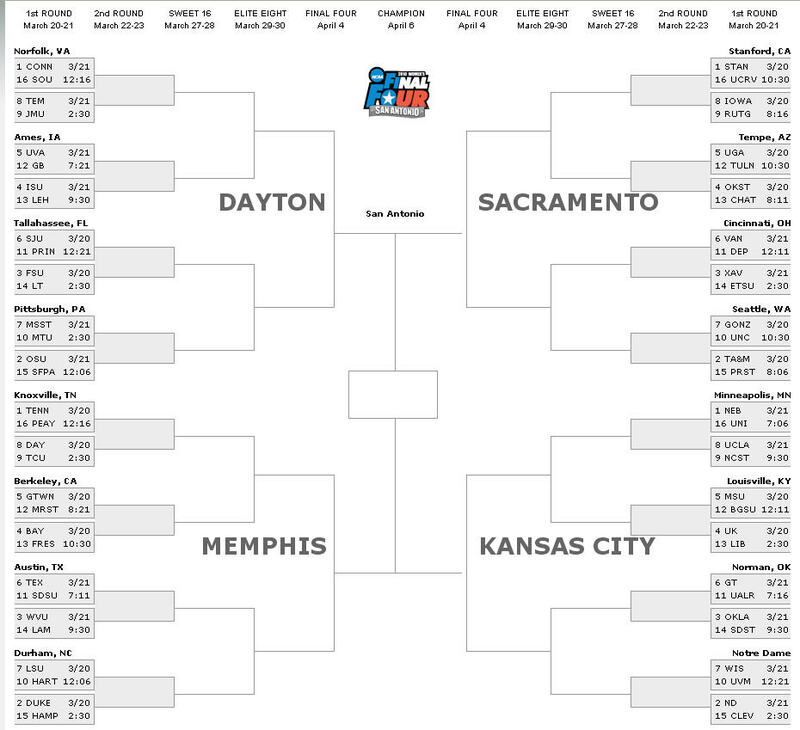 So the lopsidedness of their series with Nebraska isn’t very surprising. The Big Ten Conference has extended initial offers to join the league to four universities including Missouri and Nebraska from the Big 12, according to multiple sources close to the negotiations. While nothing can be approved until the Big Ten presidents and chancellors meet the first week of June in Chicago, the league has informed the two Big 12 schools, Notre Dame and Rutgers that it would like to have them join. 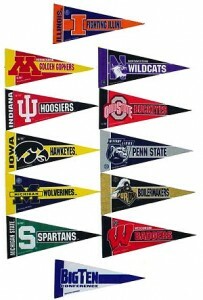 It is not yet clear whether the Big Ten will expand to 14 or 16 teams but sources indicated Missouri and Nebraska are invited in either scenario.Â Notre Dame has repeatedly declined the opportunity to join the Big Ten.Â If Notre Dame remains independent, Rutgers would be the 14th team.Â The Big Ten would then decide whether to stop at 14 or extend offers to two other schools.Â If Notre Dame joins, sources say an offer will be extended to one other school making it a 16-team league. All four are interesting choices, for different reasons. Notre Dame, of course, is a prize that the Big Ten has been pursuing for years, but it’s always been the one that got away. Given their lucrative television contract and national fan base, remaining independent has always seemed to be to Notre Dame’s advantage. Times are changing, though, and the Fighting Irish aren’t what they used to be. Putting them at the center of a conference where they would be instantly competitive might just be what’s needed to reinvigorate a program still hurting from the Charlie Weis years. Rutgers seems like a odd choice at first because of it’s geographic distance from the rest of the Conference, but there are two reasons why it makes sense. Under Greg Schiano, the Rutgers football program (and make no mistake, this expansion is mostly geared toward football) has become credible in a way that it never was before. When I attended there in the late 80s and the Scarlet Knights played a rare game against Michigan State, it was an occasion for laughter in Lansing, Michigan. Not anymore. Second, bringing in Rutgers gives the Big Ten access to two of the biggest media markets in the country, which would be a big deal for both football and basketball. As for Missouri and Nebraska, it’s interesting that the Big Ten would be so brazen about poaching from the Big 12, but both schools would be excellent additions on the football side to a conference that has come to be dominated in recent years by Ohio State and Penn State. Bringing the Tigers and Cornhuskers into the conference, along with Rutgers and Notre Dame, would instantly make football season much more competitive. All in all, this seems like a smart move for the Big Ten. I think Suh is a safer pick than Bradford. NFL.com writes- Suh is an excellent combination of size, strength and athleticism. He isnâ€™t a massive body but has enough power to play as a nose tackle in a 3-4 scheme or as a 4-3 defense tackle or end. He utilizes excellent hand strength and quickness to control defenders. Suh is often unblockable for one offensive lineman and draws many double teams from opposing offenses. He shows great range to make plays outside the tackle box and is quick to shed blockers to get to the ball. Suh is a disruptive lineman that can create havoc with penetration versus the running game. Suh has developed an expanded pass rush package with counters coming off his initial power move. His production, power, athleticism, technique and versatility make him arguably the best interior defender in this years draft. Suh is a dominating player that projects as an impact defender in his rookie season. 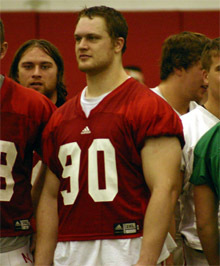 The Rams have selected Nebraska DE Adam Carriker with their first selection in the 2007 NFL Draft. Scout.com Player Evaluation: Hard-working and tenacious, Carriker is a smart prospect who could be used at a variety of positions. Looks like a perfect two-gap end, yet may also fit in at defensive tackle. His draft stock is soaring, and he may end up as a top 12 pick. Biography: Three-year starter awarded All-Conference honors after his junior and senior campaigns. Totals last season were 52/16/7, with one interception and three pass break-ups. Junior totals included 43/17/9.5. Pos: Physically impressive prospect who plays an intelligent brand of football. Instinctive and immediately locates the ball. Moves laterally with speed defending the run and has a burst upfield rushing the quarterback. Makes plays in all directions, immediately altering his angle of attack or redirecting to ball handlers. Flashes power and wraps-up tackling. Neg: Stymied at the point of attack by a single blocker. Stands to develop more moves to disengage from opponents. It’s the best of the best worlds for St. Louis fans, as the Rams filled a pressing need by drafting an excellent player and no one should be happier than Leonard Little. Though Carriker isn’t fast enough to consistently turn the corner, he has the quickness to prevent blockers from getting into good position and he already shows a good variety of pass rush moves. His ability to get after the quarterback should make it more difficult for teams to adjust their pass protections to account for Little. Carriker could have an even bigger impact on the run defense. Few young players use their hands and shed blocks as well as Carriker. He’s also big enough to hold his own at the point of his attack and the non-stop motor to make plays in pursuit. However, no prospect is perfect and there is a reason he was the third defensive end taken in the draft so Carriker has to continue to work on his pass rush moves and work on his ability to protect his legs when blockers try to cut him. So as the Bowl season is now in full swing, and we are starting week 2 of the Bowl Games, I figured it would be a good time to bring up the debate of the Greatest College Football team of all time. If you think of all of the great teams throughout history I think the 1995 Nebraska Cornhuskers team is at the top (or close to it) on everyone’s list. Coached by the legendary Tom Osborne this team was loaded on both sides of the ball. Running their traditional triple option nobody was able to stop them, including Florida in the 1995 Fiesta Bowl (National Championship Game). Below is a highlight reel from YouTube, which includes the greatest run ever (by Tommie Frazier when 6 Florida players had him stopped). I would be interested in hearing your thoughts on the greatest college football team ever. LINCOLN, Neb. Â· Former Miami Dolphins fullback Andra Franklin died Wednesday in Lincoln of natural causes. He was 47. Franklin’s body was found by police at his Lincoln apartment. He had heart problems and other health issues in recent years. He was drafted in the second round by the Dolphins in 1981 and played for four years, starting in Super Bowl XVII against Washington. He is ninth on the team’s all-time rushing list with 2,232 yards and 22 touchdowns from 1981-84. A knee injury forced him out of the league by the time he turned 26. Franklin played at Nebraska from 1977-80, rushing for 1,738 yards and 10 touchdowns. I remember Andra’s days with the Dolphins. How football has changed in 20 years. No Dolphin FB gets more than 5 carries a year now, alone become one of the team’s top rushers.